When repairing a garbage disposal or dishwasher unit, often times it turns out to be a wrong setup of drain hose that comes from the dishwasher being connected directly to the disposer plug hole. It could be a plumber’s ignorance back in old times when the dishwasher was installed, where the entire drain hose setup should have been either high loop or air gap method. If none of the methods was followed, the consequence can be painful such as nasty smelly odor filling inside the dishwasher and the waste water traveling back into the bottom of the dishwasher basin. 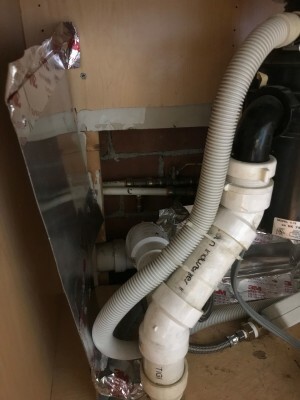 Even with the new dishwasher where the drain loop is pre-installed at the side of the unit, it is still required for the installer to implement this high loop mechanism or an air gap system underneath the sink to prevent the waste water backflow from the garbage disposal into the dishwasher. Of course any kinking or restricting of the drain hose should be avoided when setting up the high loop. In some states, this is one of the requirements that should be followed when the inspector visits and verify the proper install of the unit and other plumbing codes. The drain pipe shown in this picture clearly shows that there is no preventative mechanism via either high loop or air gap system at all. In this case, the remaining water and debris of shredded food waste can possibly push down back to the bottom of the dishwasher basin. It then will cause additional harm when the actual dishwasher cycle gets started, that waste water combines with the fresh water and is splashed onto the dishes. Until the next time of cycle, there will be always remaining water which is not only contaminated but also making sewage odors. As a rule of thumb, the best approach is to hang the drain pipe as high as possible under the countertop. An alternative to installing a high loop is to install a device above the sink called an air gap. The downside would be a look of the entire kitchen area where an extra device is showing. If it’s not an absolute requirement by the state code, it would be better to hide an extra part below the sink which will do the same job function.